The days passed when getting Google Adsense approval fast was a big deal and people faced a lot of difficulty, however now, i encountered many scenarios where people get approval for their 1 week old blogs without much content. If you are asking how to get google adsense approval in 1 minute, you are at wrong place because Google takes it’s own time, you can’t eliminate. For those who don’t know yet how to make money with Google Adsense, Google is an Ad based publisher program when you can join to start displaying google advertisers ads and can earn money if your site visitors click or view these ads. There are allot of people yet to find the answers on how to get google adsense approval and start earning with it sideways. If you are not able to figure out why your Adsense is not getting approved, this guide is for you. Many people already wrote guides on this topic, so based on the content side; it will be similar however with some genuine tips from my personal experience which worked all the time. These tips will help you too to get the Google Adsense Approval. Today, i am going to help you with some straight forward set of advice those if followed, can get you an approval more likely than any other methods at first attempt. Google has their own Adsense Policy guide, that can teach step by step what to do to get adsense approval and how to avoid banning in case of phishing activities done by you or other website visitors. Now that you already know what Google wants from you using above Policy page link, still you may get rejection due to many parameters like less content, guidelines violation, domain age, Plagiarized Content, Hacking Guides etc. So, you think you are going to crush it and soon will get an approval with above tips only? Still many people fail to get approval at one go. Nobody can tell you exact reason of rejection except Google itself, however they simply email back with a common link that lands you to their policy page. Now you have to figure out the issue on your own. I’ve a solution for your problem Let’s dive deeper. Really no one can tell you the reason except Google and they don’t respond to more than 90% of revaluation requests. But, below is the checklist that i managed to collect with my all the websites and i get approval every time using them as guidelines. Google always look for clean, smooth and informative website rather than heavily designed un managed. Make sure your website is clear and every information is available within 3 clicks to user even if that is on internal pages. It is the biggest point of rejection if not managed correctly; from Google Adsense Approval Team. Your website should have enough content, with quality and quantity managed appropriately. In my case i had just 8 Blog posts written on my website and all the posts were more than 800 words with proper usage of images, On-page SEO, Alt tags and clear Call to action. It’s great if you manage to get Social Shares and Blog post comments. It helps increase chances of quick approval (Though Google doesn’t specify this requirement but it worked in my case as a vote of confidence). Its an evergreen discussion topic in many forums because many website owner got approval for their Adsense account within few days of domain purchase however it is advisable to apply only if your domain is atleast 90 days old. When i applied, i had my domain 3 month 8 days old. When you start to write content, you sometimes end up getting no ideas how to proceed further or you simply copy paste other website content or spin content using spinners. Google crawlers are smart enough to check plagiarized content and you’ll not get an approval from adsense team for sure. You will also get penalized by Google as well for copied content and you may incur​ huge losses in terms of traffic and earnings both. Better avoid at any case. Content must be free and self-written. 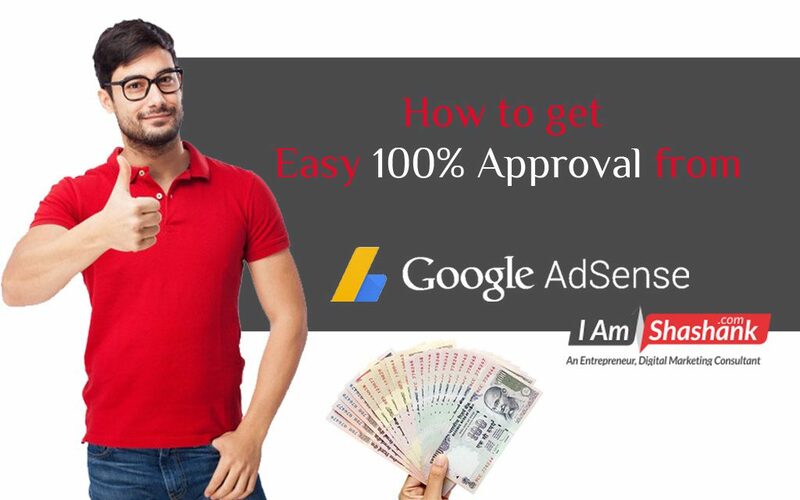 There are many other parameters Google Adsense Approval Team look for; before approving your account however these above parameters helped me to get approval instantly and may differ in your case. Google Adsense Team normally takes 1 to 4 weeks of time to analyse and approve your account and you can reapply in case of rejection after 7* days only (Check for their guidelines in case of any change). Google Adsense works well with high-traffic websites or targeted niche/ micro-niche websites or blogs else your targeted keywords CPC (cost per click) should be high to earn better with low traffic. Adsense release payment only if you reach a minimum threshold of $100. For low traffic websites, it takes a allot of time sometime months to meet threshold. In case of WordPress website, you can Use free Ad Inserter Plugin to place ads anywhere on your website. Best placement of Ads for High CTR (Click through rate) would be Sidebar, Start of your content, Middle and End of your content part. Rest you can try Heat Maps or A/B testing tools to look for specific part of website where you are getting maximum clicks and you can place your ads nearby to increase earnings. In case you experience low earning, you may try Affiliate Marketing which is first recommended way of online money making. You can promote Affiliate products for handsome commissions. Best affiliate networks you can try for Indian Traffic are CJ Affiliates and Vcommission. These can be your savior with most Indian Brands available with them specially vcommission for Indian origin brands. Once you are done optimizing your website with a sales approach that Adsense can feel valuable to approve for your and their more earnings, you will get approval very easily. Once you get approval, you can start to embed Adsense Ad Unit codes on your blog but you don’t know how to add those in specific places of Blog or Website to get maximum CTR and thus money. Here is a video explaining the process step by step with Ad Inserter Plugin a well that helps to assign ads anywhere you want. Here is the video and Do Subscribe to channel as it has great knowledge and value addition to your skills. Now that you know, how Google Adsense Team works behind the scenes and there is no Adsense approval trick that someone can help you with, you can optimize your website and apply back again. Get the best content on your site and make sure they need to publish Advertisements on your blog so information should be crisp, clear and to the point always. Usually they respond back in 7 days (my case) and following above checklist, you should get approval from them for sure in 1 day also. Many folks like you are still in dilemma, what to do in terms of getting their Adsense approved. Share this article to help them know the cause of rejection and embrace again with Quick Approval. What worked for you in getting Google Adsense Approval fast? Tell me in comments below.